One way we are able to build relationships with the people around us, the people God places in our paths, is to help them by meeting a physical need. The Bridge is the church's way of coming together and being the storehouse. As a church, we keep the baskets stocked with toiletries, socks, underwear, or other items a person may need. Add to a basket when you can, take when you need to. Be the bridge to Christ's love. We have been blessed to be a part of the River Valley Regional Food Bank. Through this organization we can provide food boxes to anyone who may need it. In each box, you'll find approximately a week's worth of food staples for a small family. We do our best to make each box well rounded with a variety of foods. We also have, by availability, frozen meats for those who may need it. 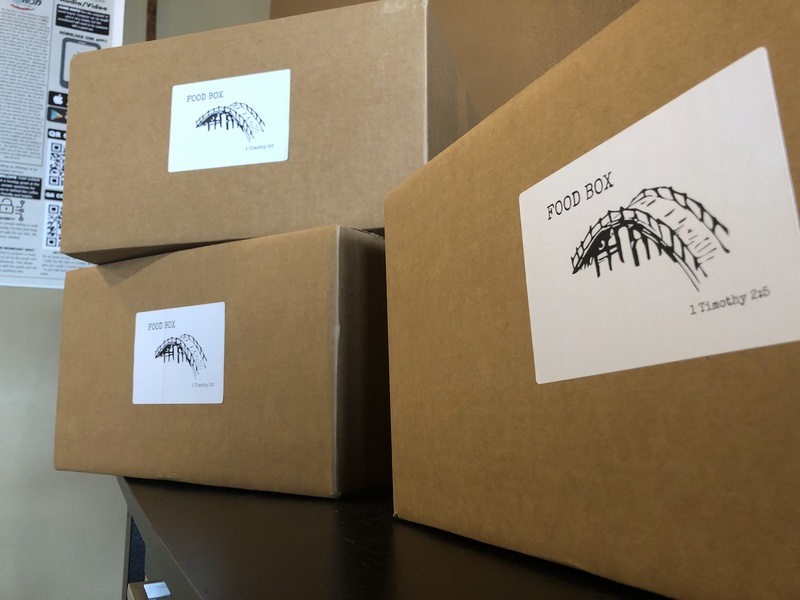 Our food boxes can be found in the main hallway and can be taken as needed. But you'll need to find a staff member if you need any frozen items. We also need volunteers to pack the boxes each month. This is done the Thursday before each community meal at 9:00.